Diego Ulissi dashed to his first victory of 2018, winning out of a small group at the end of a mountainous stage 5 at Tour de Suisse. Italian Diego Ulissi dashed to his first victory of 2018, winning out of a small group at the end of a mountainous stage 5 at Tour de Suisse Wednesday. Quick-Step’s Enric Mas was second behind the UAE Team Emirates rider. Tom Jelte-Slagter (Dimension Data) finished the 155km day third in Leukerbad, Switzerland. Coming home eighth in the lead group of 15 riders, Richie Porte moved into the overall lead, profiting from his BMC outfit’s win in the stage 1 team time trial. “I am just happy to be back racing and to have good form. It wasn’t a simple day but this jersey is all credit to my team today,” Porte said. “The team was absolutely superb. They were fantastic all day. It was a hectic start and we covered the first 100km super-quick and I don’t think it was an easy day for anyone. Also of note, U.S. national champion Larry Warbasse was on the attack, though he couldn’t fend off the peloton. 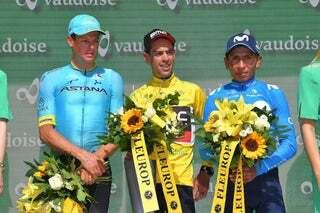 The Aqua Blue Sport rider took an emotional victory in last year’s Tour de Suisse on stage 4 to Villars-sur-Ollon. After Wednesday’s summit finish, stage 6 has a less menacing profile. After two categorized climbs in the first half of the 186km race, there will be a long 50-kilometer run to the end in Gommiswald. However, with 3,300 meters of climbing, it’s unlikely any of the sprinters will stay in touch with the lead group.